It’s rare for pro boxers from the same gym to fight each other, but that’s just what’s going to happen this coming Saturday, when Enfield’s Michael Grant takes on Canning Town’s Billy Morgan, on the undercard of the Dereck Chisora versus Kevin Johnson WBA/WBO International Heavyweight title fight, that headlines the Frank Warren promoted ‘ROCK THE BOX III’ at the Copper Box in Stratford on Saturday 15th February 2014. 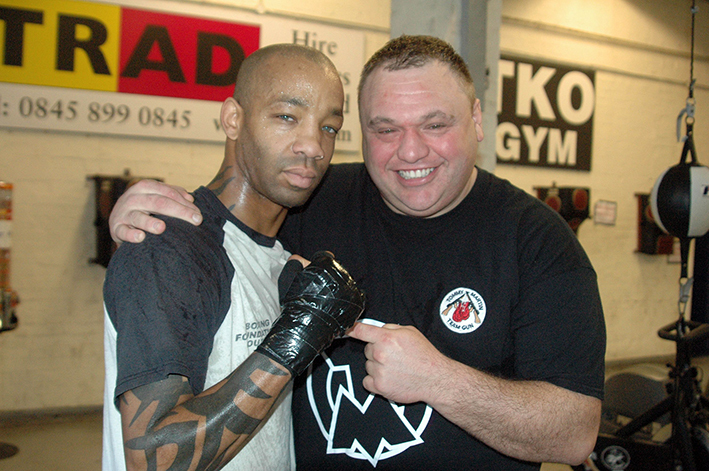 Both Michael and Billy have been coached at the TRAD TKO Gym in Canning Town, for the past four years or so, Michael by Barry Smith and Billy by father and son team Jimmy and Mark Tibbs. During that time the pair have trained alongside each other and each has helped the other with sparring for their previous fights, which in itself adds another competitive element to the February 15th showdown. It’s hard to split the pair in most ways, yes former ABA Champion Michael has fought twice as many pro bouts as his gym mate, eighteen in all (13-4-1), against Billy’s nine bouts (9-0) but they are ranked just two places apart, Michael #31 and Billy #33 by boxing stats site BoxRec.com. Billy has publicly stated that he’s relishing the fight, as he sees fighting Michael as a genuine step up in class. Michael on the other hand sees the fight as ‘the one’ to get his career back on track, following a stoppage loss to unbeaten former Super Featherweight English Champion and Prizefighter Lightweight tournament winner Terry Flanagan back in October, which marked his return to competitive action following two years without a fight. Following a sparring session with undefeated TRAD TKO gym mate Tommy ‘Da Gun’ Martin, Michael made it very clear he intends to be the one bringing the victor’s laurels back to the gym. “It was surprising to me that Billy’s team wanted him to fight me, when I got the call I was OK with it, Boxing is Boxing, but still I was surprised. My last couple of fights didn’t go the way I wanted, mainly because I got the call late and didn’t really get to prepare fully, this time though I have had plenty of time to prepare. Yeah, I can’t wait, training’s been going really good, Barry’s been getting me fit and ready, thing is when I’m fit - it’s game’s over. Truthfully, I see it as a fourth or fifth round stoppage, that is what I seriously see it at. I’ve sparred Billy loads of times, don’t get me wrong I have a lot of respect for Billy, but he’s easy for me to work out, like the first two rounds he’ll come and come, after that is when I come on top, as I said when I’m fit, I’m fit and I’m a hundred and ten percent fit, so can easily step it up in the fourth or fifth and then that’s it, game over. Michael Grant versus Billy Morgan features on the undercard of Dereck Chisora versus Kevin Johnson WBA/WBO International Heavyweight title fight, that headlines the Frank Warren promoted ‘ROCK THE BOX III’ at the Copper Box in Stratford on Saturday 15th February 2014.